Pro Se Productions, a leading independent Publisher of Genre Fiction, announces the debut of noted author and LAPD Detective Paul Bishop’s latest novel. The first in a series, Bishop delves into the black, white, and gray in between of the line between reality and falsehood, exploring police interrogation from thirty five years of experience, in Lie Catchers, now available in print and digital formats. "Lie Catchers crackles with authenticity. Bishop's thirty-five years as an LAPD Top Cop fuels a turbo-charged novel.” – Robert Crais, bestselling author of the Elvis Cole novels. With her special abilities, top LAPD Robbery-Homicide detective Calamity Jane Randall thought she knew all about interrogation until she met detective Ray Pagan. Wielding a suspect’s vocal intonations, emotions, and physical gestures like a scalpel, Pagan’s empathetic lie catching abilities are legendary. 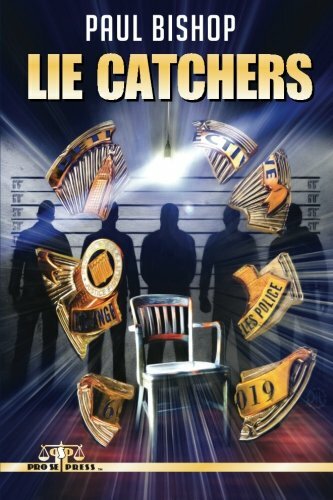 Featuring an explosive cover and logo design by Jeffrey Hayes and print formatting by David Foster, Lie Catchers is available now at Amazon at http://www.amazon.com/Lie-Catchers-Paul-Bishop/dp/151709643X/ref=sr_1_3?s=books&ie=UTF8&qid=1440952048&sr=1-3&keywords=lie+catchers and Pro Se’s own store at www.prose-press.com for 15.00. This first volume in a new series by Bishop is also available as an Ebook, designed and formatted by Forrest Bryant and available for only $2.99 for the Kindle at http://www.amazon.com/Lie-Catchers-Paul-Bishop-ebook/dp/B014LZK09K/ref=sr_1_2?s=books&ie=UTF8&qid=1440952048&sr=1-2&keywords=lie+catchers and for most digital formats via Smashwords at https://www.smashwords.com/books/view/572925. FLY GIRL SOARS AGAIN! RUSS ANDERSON’S HEROINE FACES THE MONSTER INSIDE OF ME IN LATEST DIGITAL SINGLE!